The early settlement of Redruth was originally in the Churchtown area, where St Euny Church stands today. This location, with Carn Brea on one side and Bullers Hill on the other, gave good access to the shallow lodes of tin and copper lying east to west and made it an easy site for extracting metals, including, tin, lead and copper. Redruth Butter Market has been a centre for trading since it was built in 1795. Originally a three sided development, it was open on the eastern side to what is now Alma Place. The timeline below shows some of the more significant events which have taken place in Redruth’s trading history. As Redruth grew in prosperity and importance, The Mining Exchange was built in 1880 as a place for the trading of mineral stock. The imposing façade of this exchange in Alma Place is now grade 2 listed. The building of The Mining Exchange effectively enclosed the courtyard on the fourth side, and it then looked similar to how it is today. 1564 Elizabeth I grants a market charter. 1660 Charles II grants a charter. Weekly markets held on Tuesday and Friday. 1791 Redruth Market is said to be ‘by far the largest in the county’, stretching from a market building near the site of the Town Clock and along Fore Street. 1795 Market moves location to site of current Butter Market buildings and Fair Meadow car park. Over the next centuries, covered and open areas support the sale of livestock and every sort of produce and draw sellers, and buyers, from far and wide. 1802 Baptist chapel built on later site of Mining Exchange on Alma Place. 1823 Francis Basset, Lord de Dunstanville buys the market for £1,000. 1847 Starving men and women occupy the market and demand that sellers reduce their prices. 1867 Soup kitchen for poor run at back of Market House/Meat Market building (on Station Hill side of complex). 1877 Improvements to market buildings. 1880 Mining Exchange built on Alma Place at a cost of £500; designed by local architect, Samson Hill in Neo Gothic style. Armaments for the Redruth Rifle Corps are stored at the Market House/Meat Market. 1892 Pigs arrive in huge numbers by train or road and are driven down to the market. Redruth Market is the largest pig market in the West Country until the 1980s. c.1914 Horses mustered in the Fair Meadow to be taken for army use in the First World War. 1902 Redruth Chamber of Commerce debates buying the market ‘if it can be obtained at proper terms’. 1919 Cattle Market Company formed to expand the livestock sales. 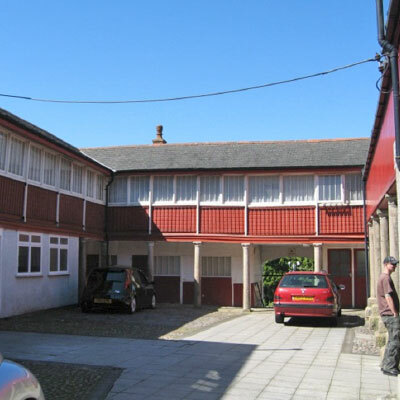 1958 Redruth Market Company Ltd sells the Market House/Meat Market which becomes a carpet warehouse. 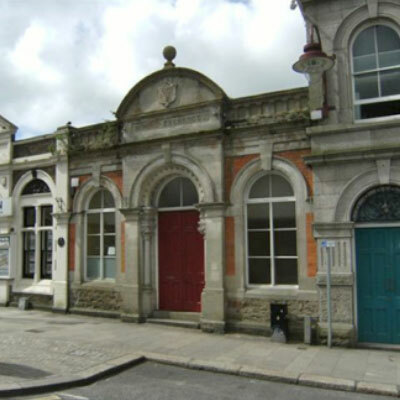 2017 – May, Redruth Revival CIC (Community Interest Company) complete the purchase of the Buttermarket from Redruth Market Company, with the intention of reviving it for the 21st century as a community and retail space around the courtyard and with a workplace hub in upstairs offices, right in the heart of the Redruth.